A mini canoLAB display at the Alberta Canola booth at FarmTech 2019 showed what small clubroot galls look like, which is helpful for early detection. The booth also had healthy looking plants with large galls. This was a big eye-opener for farmers who stopped by the booth because the plants looked so good, they would never suspect the plants had serious galls. Yet these galls will be releasing billions of spores into the soil. Small clubroot galls like the one on the left root won’t cause any above-ground symptoms but can release a lot of spores into the soil. Management of clubroot has to start with early scouting. Early detection will only occur with random sampling of plants and soils in high-risk areas (especially field entrances and low areas that may accumulate run-off water). 1. Delay arrival of clubroot to a field. It is easier to manage clubroot disease when you don’t have it. Clubroot is a soil-borne disease and heavily-infested areas can have millions of spores per gram of soil. Preventing the introduction of clubroot is about preventing soil movement onto and around the farm. Knock dirt off equipment. Rough cleaning of equipment removes 90-95 per cent of soil and spores. Washing with compressed air or a pressure washer brings that up to another level. Mist-on disinfectant, such as a two-per-cent bleach solution, will finish the job. Based on a recent study by Michael Harding with Alberta Agriculture, the most effective, cheapest and most readily available cleaning solution is bleach. There is no close second. Think biosecurity. When buying used equipment or hiring custom operators check that the machinery is clean before it arrives on the farm. If not clean, what is the risk that hitchhiking soil has clubroot? Farmers can demand the same inspection of machinery digging pipelines or installing oil and gas infrastructure on their land. Top 10 ways clubroot can spread. Reduce erosion. Wind and water erosion of soil will move clubroot spores, and reduced tillage will reduce erosion of infested soil. Keep tools, boots and tires clean. While this may represent very small amounts of soil movement, people such as agronomists and crop inspectors who move from field to field will want to take measures to reduce the risk that they’re moving the spores. Park on the road or wash the vehicle before moving to the next farm. Use booties or a bleach-bath for boots. Entry and exits. Field entry points where machinery unfolds and starts working are often the first and most heavily infested areas. Consider planting a small square of permanent grass at field entry points, providing a non-host-crop area for soil to drop. Another idea is to have a separate field exit, also grassed, so machinery leaves an infested field from an area likely to have less clubroot. Dig up plants and look for galls in all canola fields. If uncertain, send plants away for DNA tests. Because the goal is early detection, include random searches in fields that may be showing no signs of disease. Test soils for clubroot DNA. Random searches for galls in high-risk areas of a field will improve the chance of finding patches that are small enough to manage. High-risk areas include field entrances but also low moist areas where soil runoff can deposit spores and where infection is most likely (due to the moisture). Low pH areas can also be higher risk, but we don’t have a scale to quantify how risk varies by pH. We know from lab analysis that clubroot galls do not grow well with pH of 7.3 or higher, and there is some indication that lower pH means continually higher risk because clubroot seems to thrive in acidic soils. But higher pH does not mean immunity. Clubroot patches identified early enough and small enough can be managed in various ways to reduce the clubroot spore load in those patches and prevent clubroot from spreading beyond that patch. Lime. Increasing soil pH in areas with clubroot can reduce clubroot severity. Brassica vegetable growers around the world have been using lime for decades for this purpose. The increase in pH has the added bonus of increasing availability of other key nutrients. Targeting small early-identified patches is preferred because trucking the required rates of lime can be expensive. When considering a lime source, look for a high concentration of calcium carbonate (CaCO3) or hydrated lime (Ca(OH)2) per tonne and consider purity of the source. Large-grit lime could take years to be fully effective but it is much easier to handle and apply. Powdered lime acts fast but is hard to handle and spread in large volumes. On application style, lime is often roto-tilled into the soil in research plots, but this tillage will add to the spread of clubroot. Farmers need reduced-tillage or surface-applied liming techniques that work. Reduce tillage. Because a single gall produces millions of spores and the decomposing gall will release the spores into the surrounding soil, tillage will disperse the spores to a larger area than if the soil is left undisturbed. Grass. Seed the patch to a non-host grass such as ryegrass that can fill in quickly and tie up the soil to prevent wind and water erosion. While the patch is in place, farmers will need to control host weeds, which include volunteer canola, flixweed, shepherd’s purse, stinkweed and mustard. Leave the patch until soil surveys indicate spore levels are very low or zero. Fumigation (or solarization). Mary Ruth McDonald, clubroot researcher at the University of Guelph, has had success reducing clubroot spore counts in small patches by fumigating the soil (with Vapam) and then covering the patch with film. Interestingly, the film covering may actually work on its own, McDonald observed. The film captures heat, creating a hot zone that seems to kill clubroot resting spores. Evidence from three rotation studies done in Canada (two at Normandin, Quebec, one in Alberta) suggests that two years between host crops (canola, mustard or any brassica vegetable) is the minimum rotation to manage clubroot spores in a field. A two-year break is the same as a one-in-three rotation, such as canola-cereal-pulse. A one-year break is not enough; resting spore numbers never drop enough to provide any reduction in risk. 5. Grow CR varieties as soon as clubroot is in the area. The CR trait will prevent most infection, which will help to keep spore counts low in fields that already have lower counts. With fewer resting spores in the soil, the risk of building up virulent pathotypes is reduced. 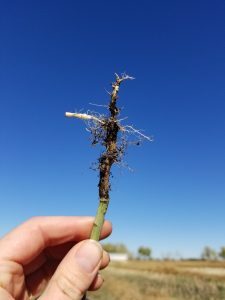 When spore counts reach high levels, clubroot is more easily moved from field to field, clubroot will cause yield loss in susceptible canola (even with a four-year rotation) and clubroot will overcome CR traits.